Uncontrollable fire on Friday swept through a large portion of the Achimota Forest, destroying a major part of the reserve. When Nii Ogbamey Tetteh visited the scene, major parts of the forest had been razed down with smoke still emanating from some tree stumps. A vast area of the forest close to the Abelemkpe roundabout, towards the Greater Accra Regional Forestry Commission office, had been lost to the fire which according to an eyewitness started around 11:45am. Another eyewitness told the paper that attempts by some workers of the Forestry Commission, together with the police and other volunteers, to bring the fire under control while they awaited the Fire Service team to get to the scene proved futile due to the high harmattan winds. The Fire Service personnel from the Abelemkpe fire station were said to have fought the raging fire for close to an hour before extinguishing it. Though the cause of the fire was not immediately known, Edith Ansah, the Greater Accra Regional Manager of the Forestry Commission, said she suspected that the fire was ignited by wee smokers who were smoking in the forest. “I suspect that the wee smokers went in there to do their own thing but failed to completely put out their flames. Last year around this time, the same thing happened and we had parts of the forest burnt as well,” Madam Ansah told Nii Ogbamey Tetteh in an interview. “My reason is that from what we saw, the fire started right in the middle of the forest or let’s say right within the forest. But if it started outside, I would have said a passer-by had thrown away a cigarette stump which had caused it,” she added. “Though we patrol the forest a lot, these smokers lurk around till my patrol team go for lunch or break and as soon as they leave, the boys go in there to do their own thing,” she said. 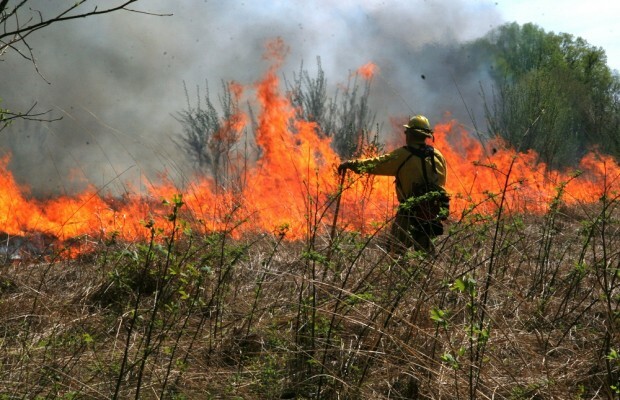 She urged Ghanaians to be very careful in handling fire close to bushes or forest areas in this dry season to avert fire destroying the country’s forest and game reserves. Within the past 62 hours, Ghana has recorded several fire outbreaks and it is feared that more incidents could occur during this severe harmattan period if precautionary measures are not put in place.